In recent years, the Japanese government has had considerable success in stimulating many African businesses and institutions to experiment with the adoption and implementation of the 'Kaizen' business philosophy. Closely associated with Japan's own rapid industrial development in the 1970s and 1980s, kaizen has been seized on by a range of African countries aiming to emulate this apparently miraculous success story. One such country is Ethiopia, where kaizen has been given a prominent place in the ruling party's second national five-year Growth and Transformation Plan (2015-2020) and where dedicated official institutions devoted to the study and dissemination of the concept have been established. Drawing on fieldwork conducted in Addis Ababa in May 2016, this paper examines the motivations of the key actors involved in bringing kaizen to Ethiopia. Ethiopia's ruling party actively seeks to harness this philosophy not only towards economic growth, but also towards political gain and even for the purposes of broader social engineering. Kaizen is therefore a key plank in the Ethiopian government's vision of state developmentalism, while for the Japanese government it is an opportunity to bolster its soft power by acting as a reliable and pragmatic political partner to Ethiopia. This approach towards development assistance runs largely parallel to aid programmes conducted by Western donors but represents part of an increasingly central (co-constructed) project between primarily East Asian donors and African recipients to bring the developmental state to Africa. Elsje Fourie has been lecturing on Globalisation and Development Studies in the Department of Technology and Society Studies since September 2013. Her prior research primarily focused on the emulation of East Asian developmental trajectories by Ethiopian and Kenyan elites. Her ongoing research seeks to further explore this process of "South-South learning" through the use of a transnational and multi-sited methodology and through the use of modernity as a theoretical lens. She also has extensive training in human rights fieldwork and professional experience in the management of development projects, monitoring/evaluation, capacity-building and peacebuilding in inter alia Indonesia, Northern Ireland and Japan. AFRASO Lecture by Daniel Traub (New York): "Little North Road"
We are delighted to invite you to the upcoming AFRASO Lecture: "Little North Road" by Daniel Traub (New York). The lecture will take place on October, 26th in room HZ 14 (Hörsaalzentrum, Campus Westend) from 4 pm - 6 pm. The project encompasses a book, a short film, website and a traveling exhibition. Traub is also available to give an artists talk on the project which includes images and the short film. Daniel Traub, born 1971, is a New York-based photographer and filmmaker, originally from Philadelphia. Traub, whose mother is Chinese, lived in China from 1998 to 2007, working as a cinematographer on documentary films. He was also engaged in long-term photographic projects, including Simplified Characters, a series of street pictures that explore the vast changes at the beginning of the 21st century in urban China, as well as the series Peripheries, which looks at the landscape at the outskirts of several major Chinese cities. His photographs have been exhibited internationally, including solo exhibitions at the Catherine Edelman Gallery in Chicago, Slought Foundation in Philadelphia and the Lianzhou photo festival in China. His work can be found in public and private collections, such as the Margulies Collection at the WAREhOUSE and the San Francisco Museum of Modern Art. His work has also appeared in publications including Aperture, European Photography and The New York Times Magazine. Traub has published two monograph with Kehrer Verlag: North Philadelphia (2014) and Little North Road (2015). More of his work can be seen at danieltraub.net and itinerantpictures.com. We are delighted to invite you to the upcoming AFRASO Lecture: "Little North Road" by Daniel Traub (New York). The lecture will take place on October, 26th in room HZ 14 (Hörsaalzentrum, Campus Westend) from 4 pm - 6 pm. We are very pleased to announce that the proceedings of the first AFRASO conference in 2014 in Kuala Lumpur, edited by Arndt Graf and Azirah Hashim have just been published. Since the 1990s, interactions between Africa and Asia have intensified considerably. Earlier academic research focused mostly on the new role of China in Africa, often with an emphasis on asymmetric power relations in the political and economic fields. In contrast, this book demonstrates that the range of new interactions between Africa and Asia is much broader, also involving various small- and medium-sized actors in Asia and Africa in various fields. The ensuing diversification brings with it greater choice and – at least in theory – greater agency. 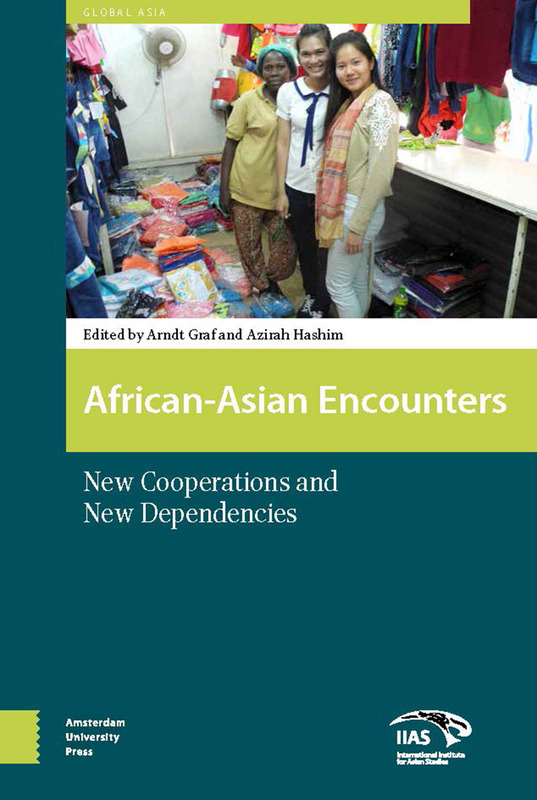 African-Asian Encounters: New Cooperations and New Dependencies gives scholars in Asian-African Studies well-grounded insights into the developments taking place in the two continents and can contribute towards policy advice on interventions for facilitating improved Asian-African ties. Arndt Graf is Professor of Southeast Asian Studies at Goethe University Frankfurt. Since 2003 he is also the project leader (with Frank Schulze-Engler) of the research project AFRASO (Africa’s Asian Options), funded by the German Ministry of Higher Education and Research. AFRASO involves 40 colleagues from a broad variety of disciplines. Kaizen manufacturing processes created in Japan to reform the way enterprises deliver products to their customers. Many manufacturing enterprises in Ethiopia dream to build a culture of continuous improvement similar to Japan enterprises to retain their market share by satisfying their domestic market and explore and expand to global market. Ethiopian leather and leather product manufacturers are disadvantaged to compete in global market due to technological gap as well as lack of knowledge in key managerial methodologies like kaizen. Engineering capacity requires resource and time to catch up. However, managerial capacity can be improved quickly since kaizen tools are developed in a way to be appreciated by all the workers, and its fundamental methodology is not very complicated. The government of Ethiopia introduced kaizen as management tool with assistance of Japan international cooperation agency (JICA) by requesting to the government of Japan for kaizen technology transfer to Ethiopia in 2009. At the beginning of kaizen philosophy implementation in Ethiopian, kaizen is hot talking issue in society due to high promotion and news through government media. It has been reported that as high as birr 1.2million is earned in one company by implementing kaizen tools. However, while some educated people started complaining the reported quantitative results, others accepted kaizen as improvement tool that create clean work environment. The effective implementation of kaizen methodology will lead to the success of the organization by employing 5S, quality control circle (QCC), operation standard, time study and elimination of wastes. Furthermore, correctly introduced and implemented kaizen policy in some industries in Ethiopia was found increase in productivity of labour by reducing time to search tools, improved defect ratio and lead time while improper implementation of kaizen creates instability and wastage of resources. There are few challenges in implementing kaizen in Ethiopian industries. Firstly, power concentration in top management. Kaizen is empowering the worker in work floor. Hence, it requires top management change and changing workers attitude and trusts the workers in work floor. Secondly, employees didn’t have the full capacity to accept the kaizen management system especially in case of Ethiopian leather and leather manufacturing industries. Here, I report kaizen in Ethiopian industries through analysis of successful implementation of kaizen strategy and reasons of kaizen implementation failure. We are delighted to invite you to the upcoming AFRASO Lecture in cooperation with the Korean Studies: "The Two Koreas and Africa in the 21st Century" by Yejoo Kim (Centre for Chinese Studies, Stellenbosch University). The lecture will take place on June, 14th in room 717 (Juridicum, Campus Bockenheim) from 4 pm - 6 pm. At the end of May 2016, South Korean President Park Geun-hye paid her first official state visit to Africa, visiting Ethiopia, Uganda and Kenya. While South Korea’s relationship with Africa today is largely understood in terms of resource diplomacy, a rivalry with North Korea persists – highlighted during President Park’s recent visit. This talk discusses how the two Koreas have made inroads in Africa, while simultaneously fending off each other. Despite competition for influence, both Koreas have faced challenges in their attempts to export their respective ideologies and developmental models to the continent. North Korea’s Juche, once successful in dissemination to allies in the Third World, is now the quaint preserve of the deeply isolated “Hermit Kingdom”. Similarly, South Korea’s export of its developmental model to Africa is merely one tree in a forest – with competition (rather than cooperation) with China and other emerging countries that also wish to boost their partnerships with African states. Yejoo Kim (PhD) is a Research Fellow at the Centre for Chinese Studies, Stellenbosch University, South Africa. She received her PhD in Political Science and her MA in International Studies from Stellenbosch University. Her research agenda centres on Africa’s development with reference to East Asia. Her previous research includes Special Economic Zones in Africa, Chinese investment in the manufacturing sector and its implications for labour in South Africa. Currently, she is conducting research on East Asian actor’s involvement in Africa’s infrastructure focusing on the Kazungula Bridge Project in Botswana. She also endeavours establishing Asia Literacy in Africa. She is running a Korean Studies Programme sponsored by Academy of Korean Studies (2016-2019). We are delighted to invite you to the upcoming AFRASO Film Screening and Lecture in cooperation with the Frankfurt Memory Studies Platform: "Indian Ocean Memories and African Migrants" by Shihan de Silva (University of London). The film screening and lecture will take place on June, 13th in room CAS 1.801 (Casino, Campus Westend) from 12 pm - 2 pm. Dances and songs in creolised Portuguese, a language of trade and commerce for 350 years in Sri Lanka, connect Afro-Sri Lankans to Africa, no longer an imagined homeland. Africans were prominent in the Indian Ocean World in various spheres but the majority of Afro-Asians have been pushed to the margins due to political changes and loss of patronage. Performing traditional art forms enable Afro-Sri Lankans to carve out a niche in the cultural arena of their hostland. Fading memories of slavery and the slave trade can still be heard in the narratives of their oral histories. They rekindle in East-West trade and colonial interventions in the Indian Ocean. Dr Shihan de Silva Jayasuriya is a Senior Fellow at the Institute of Commonwealth Studies (University of London), a member of the UNESCO International Scientific Committee (Paris) and an elected Fellow of the Royal Asiatic Society (Great Britain & Ireland). She has a PhD (Linguistics), an MSc (Finance) and a BSc Honours (Economics) from the University of London. She is the author of eighty five peer-reviewed articles in international journals, and has also written eight books in the fields of Historical Linguistics, Ethnomusicology, Portuguese Studies, African Diaspora Studies and Ethnography. Among her publications are ‘The Portuguese in the East : A Cultural History of a Maritime Trading Empire’ (I B Tauris, London), ‘African Identity in Asia: Cultural Effects of Forced Migration’ (Markus Wiener, New Jersey) and 'The African diaspora in Asian trade routes and cultural memories' (Edwin Mellen Press, 2010). Shihan serves on the editorial boards of African Diaspora and Transnationalism (Leiden: Brill Academic Publishers) and African Diaspora Archaeology and Heritage (California: Left Coast Press). Ort: Campus Westend, Seminarhaus, SH 1.106, 11.05.2017, 16.00 c.t. Wie aus dem Nichts bauen chinesische Investoren die Infrastruktur afrikanischer Großstädte wie Addis Abeba, Hauptstadt Äthiopiens, um. Dabei wird stets über die Gier nach Bodenschätzen und geopolitischen Einfluss gesprochen, doch was ist mit der Perspektive der Menschen, die es am meisten angeht: den Einwohner_innen Addis Abebas. Wie fühlt es sich an, in einer Stadt zu leben, die sich in kürzester Zeit radikal verändert? In der neuerdings eine 30 km lange Straßenbahnlinie läuft? In der 300 neue Hochhäuser entstehen, ein neuer Staudamm, eine neue Ringautobahn, ein neuer Flughafen … ADDIS ABABA — CHINESE NEW FLOWER ist ein persönlicher Streifzug durch die Stadt, der nicht nur Experten wie chinesische Investoren und äthiopische Städteplaner _innen befragt, sondern die Einwohner_innen der Viertel: nach ihren Erinnerungen an das alte Addis Abeba, ihr Leben in einer Stadt im Wandel, ihren Träumen und Wünschen für das zukünftige, durch den sino-äthiopischen Einfluss geformte Addis Abeba. Denn die Transformation einer Stadt ist nie nur das Entstehen neuer Gebäude, sondern stets auch die Veränderung von Kultur. ADDIS ABABA — CHINESE NEW FLOWER ist ein Dokumentarfilm, der mit subjektivem Blick nach dem Erleben der Akteure Addis Abebas fragt. In diesen menschlichen Erfahrungen wird die Transformation einer Großstadt, die Begegnung zweier Kulturen, der Kampf um das urbane Leben der Zukunft ablesbar. Der Forschungsaufenthalt im Jan./Feb. 2016 wurde durch PROMOS gefördert. CHINESE NEW FLOWER ist Preisträger der Bauhaus.Essentials der marke.6 Weimar. Silvan Silvan Hagenbrock ist seit Anfang 2016 Ko-Kurator des Programms STADTMACHER China-Deutschland. Er ist gebürtiger Dortmunder, Urbanist und Filmemacher zwischen China und Deutschland und hat zwei Jahre in China gelebt. In dieser Zeit entstand auch der Film THIS IS PAN TAO über ‚Schrebergärten‘ in Shanghai. Im Rahmen seiner Bachelor-Thesis an der Bauhaus-Universität Weimar produzierte er 2016 den Film CHINESE NEW FLOWER – über chinesischen Urbanismus in Addis Abeba. Silvan Hagenbrock arbeitet und lebt in Berlin. Two AFRASO Fellowships awarded for 2017 and 2018! Two AFRASO Felloships have been awarded for 2017 and 2018! The fellowship for 2017 will go to Seifudein Adem. ​Dr. Adem is proficient in English, Japanese, Amharic, Russian, and Oromo languages. Seifudein Adem is the intellectual biographer of the distinguished Kenyan scholar Ali A. Mazrui (1933-2014), with whom he co-authored the book "Afrasia: a tale of two continents". Seifudein Adem will use his time in Frankfurt for a comparative analysis of Asian development policies in Africa with a special focus on Japan and China. Furthermore he wants to investigate the perspectives of Africa-Asia relations in the upcoming period of an American disengagement. Seifudein Adem will be in Frankfurt in January and February 2018. The second fellwoship for 2018 was given to Shobana Shankar, Department of History at Stony Brook University. Dr. Shankar examines British colonialism, cross-cultural encounters, and the making of social difference and inequality in West Africa, particularly Nigeria, a nation that has experienced considerable religious violence in recent years. Her research brings an historical lens to Christian-Muslim relations, showing that religious difference has evolved out of complicated negotiations of gender, class, racial, and ethnic dynamics in the context of British and American Christian missionary work in Muslim areas. Her other work has focused on the social and cultural politics of medicine, the link between missions and UNICEF’s early efforts in sub-Saharan Africa, and, as a side interest, gender and racial hierarchies in blues music recording in Jim Crow Mississippi. She speaks Hausa, Kiswahili, Tamil, and French, and hopes to bring these skills to her next project on a history of South Asian-African exchanges of religious culture and “traditional medicines.” In addition to her academic experience, she has worked for UNICEF and Schomburg Center for Research in Black Culture. Shobana Shankar will use her time at AFRASO to pursue her project “The Politics of Expertise in African-Asian University Exchanges,” which traces the social and cultural significance of transregional knowledge-production in African and Asian countries. While African-Asian migration of students and faculty is often understood in terms of economic necessities and opportunities, such as insufficient supply of local skilled faculty or lower cost of higher education in the global South as compared to the North, her project takes an historical perspective on the value attached to Afrasian higher studies as a unique form of expertise. How did South-South knowledge production and exchange gain legitimacy and decenter the West? Shobana Shankar will be in Frankfurt in May and June 2018. Das Projekt AFRASO der Goethe-Universität Frankfurt untersucht seit Anfang 2013 Globalisierungsprozesse mit dem Schwerpunkt auf Interaktionen und Beziehungen zwischen Afrika, Asien und Europa. Im Kontext dieses Forschungsprojektes sind zwei Unterrichtseinheiten zu den Themen „Land grabbing, Landwirtschaft und Entwicklung“ und Cyberkriminalität entstanden, die zurzeit intensiv und kontrovers in Medien und Öffentlichkeit diskutiert werden. Beim Thema Land grabbing, Landwirtschaft und Entwicklung werden die konflikthaften gesellschaftlichen, politischen, wirtschaftlichen und ökologischen Veränderungen durch rasante Entwicklungen im ländlichen Raum des Globalen Südens in den Blick genommen. In einem kartengestützten Planspiel erlangen Schülerinnen und Schüler einen Einblick in die Ursachen dieses Wandels, erkunden translokale Vernetzungen und loten Folgen und Problemlösungen an einem konkreten Beispiel aus. Bei der Unterrichtseinheit „Cyberkriminalität - Produktion neuer Afrikabilder“ erhalten Schülerinnen und Schüler einen Einblick in Mechanismen translokaler Cyberkriminalität, lernen die Perspektiven von TäterInnen und Opfern kennen und reflektieren Folgen des Othering vor dem Hintergrund eigener Vorstellungen, Stereotype und Bilder vom jeweils „Anderen“.